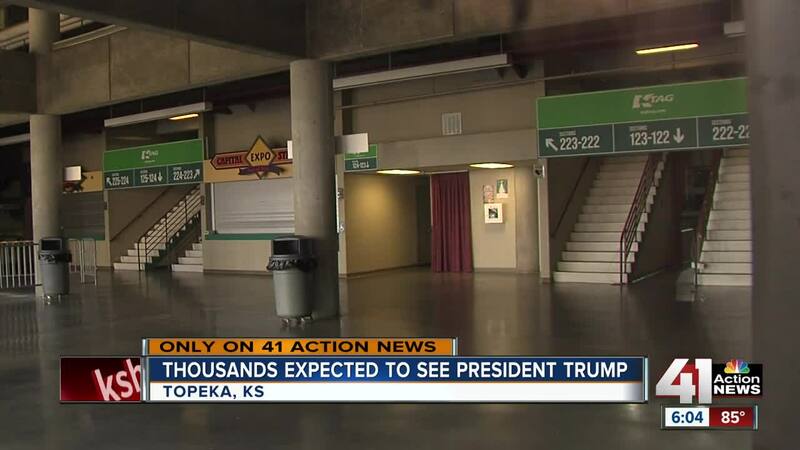 Topeka is preparing for thousands to attend President Trump's rally. TOPEKA, Kan. — Days ahead of President Donald Trump’s visit this weekend, police officers and businesses continued to get ready on Tuesday for the event. Thousands of people are expected to attend the rally at the Kansas Expocentre, with many others also planning to protest or catch a glimpse of the president outside. While security measures are being kept secret, Topeka police said officers from multiple jurisdictions will be involved in keeping things safe. Officer Beightel told 41 Action News that police have been checking social media sites this week to monitor any possible threats for the event. Days before the rally, he said police would continue coordinating plans for security both inside and outside the venue. Just across the parking lot, staff at the Capitol Plaza Hotel said they were expecting to deal with plenty of extra traffic this weekend. While the hotel is booked with guests for a conference this weekend, they told 41 Action News that their parking lots will be crowded. As the event gets closer, Soden said she was excited to welcome the president. Saturday’s rally is expected to begin at the Kansas Expocentre around 6:30 p.m. Ticket information for the rally can be found here .